This Wednesday as most people imbibe one, okay two margaritas in celebration of Cinco de Mayo, I hope they take a moment to give thanks to Bing Crosby. The crooner with the liquid voice loved Mexico, and he more than anyone else, was responsible for bringing the margarita north of the border and making it wildly popular in Hollywood during his heyday. Bing also had a soft spot for San Diego, which because of its proximity to Mexico, may be the most margarita-friendly city in the country. Our chicest mall, Fashion Valley, has a Bing Crosby's Restaurant and Piano Lounge, a modern-day supper club with live music, deep, cozy booths, and delicious cocktails. So in honor of Bing, who also happens to have made my favorite Christmas movie, White Christmas, I'm making sweet and spicy banana margaritas for Cinco de Mayo. I happen to have the key to making a perfect margarita. That's because last week I interviewed Juan Calderon, certified sommelier and beverage director of San Diego's hip El Vitral, Restaurant and Tequila Lounge, which houses over 200 types of tequila. 1. Use freshly squeezed lime juice. 2. Use good tequila. Make sure the bottled is clearly labeled "100% blue agave" or "100% de agave." Look for bottles that range between $18-28 dollars. Top shelf tequila isn't necessary for a great tasting margarita. 3. Nix the candied margarita mix, and use Curacao, a citrus flavored liqueur, available at liquor stores. (Grand Marnier or Cointreau work well too). If you're making a fruity margarita, use naturally sweet fruit purees instead of juice. Calderon recommends the brands Culinary Traditions: The Perfect Puree or Monin, which are available at most liquor stores or online. To make a classic margarita, put equal parts fresh lime juice to Curacao in a shaker. Add 1 1/2 ounces tequila. Shake, then serve on the rocks with a salted rim and a lime slice. That's it. This banana margarita is made with smashed ripe bananas, though an ounce of banana puree or creme de banana liqueur would also work. The tart lemon and citric Grand Marnier balance the banana's sweetness making it pleasingly refreshing with a smooth finish. If you're considering skipping the cayenne rim on the glass, don't. When you sip the margarita the cayenne makes your tongue and mouth tingle with heat which is then cooled with the icy margarita. Ahhhh, it's so good. Oh, and don't forget to play some of Bing's tunes along with the mariachi music. 1. Rub the rim of a chilled margarita glass with lemon juice and dip in cayenne pepper. 2. In a shaker combine alcohol, lemon juice, banana, and ice. Shake until your hands freeze and the banana is completely smashed. Strain into the glass. Enjoy. I'm serving my banana margaritas with chips and Spicy Black Bean Dip. You might want to do the same. Want to learn more about margaritas? Check out my latest piece on SDNN.com, "Cinco de Mayo: Perfect Your Margarita, Just in Time." Photo of Bing Crosby courtesy of Bafflegab26580 on Flickr. Maybe with your great information I can now whip up the best margarita in town. 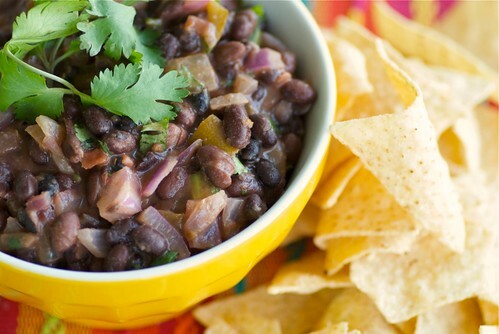 I love that bean dip! Margaritas are by far my favorite beverage. I may need to have one tonight! I had no idea that it was Bing who was responsible. So cool to know. Thanks for sharing and I can't wait to try these on Wed! This sounds pretty phenomenal. I knew it was a good idea to pick up that extra bunch of bananas yesterday! Great info and delish recipe. I love the FS info as well. Thanks! I have had many flavors of margarita in my life, but never banana. It sounds delicious! 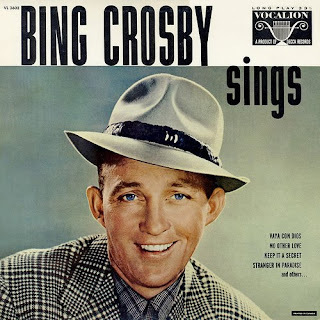 Thanks for all of this info about Bing Crosby. I feel like I can sufficiently celebrate cinco de mayo now. I am ready to celebrate. Great recipes! Happy Cinco de Mayo to you! The cayenne on the rim sounds like a perfect touch. Can happy hour go ahead and start now? susan, i can't count the margaritas i've had in my life, but i have had LOADS... not a single one with bananas, let alone cayenne. but seeing that i have all the ingredients at hand, this will be one to try very soon! teachercooks-I think you'll love both! thefrench-He was a cool dude, for sure. june-Yay! Happy to hear it! lora-I'm glad you enjoyed it. joanne-Cool! That's what I like to hear. johanna-You'll be surprised at how delicious it is! ramblingtart-I love him too, and so many of the old-timers. wow - I am on such a banana kick lately but I never would have thought to use it in a margarita. I just might have to whip one of these up! I love Bing and White Christmas too. Margaritas not so much. My wife would love these banana margaritas. I'm going to print this up right now to try tomorrow. Thanks! 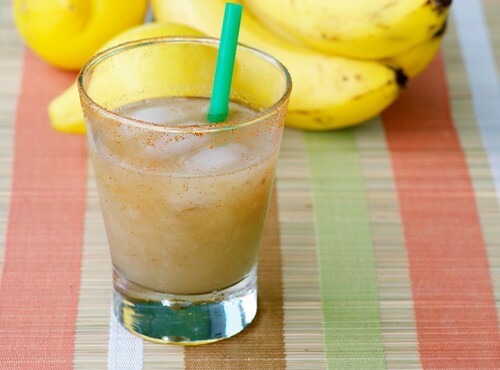 banana margaritas sound fantastic and different! The bean dip is super tempting my taste buds. I have never had banana margaritas! such a gap in my education must be filled at once; well, maybe I will wait till tomorrow! kevin-There are people who don't love margaritas? dave-Wonderful! You should surprise her! nisrine-They really are different and exciting! banana margarita...holy smokes. Perfection has just been made.